Submitted by Migrate Wizard on 2015-08-19 05:44. 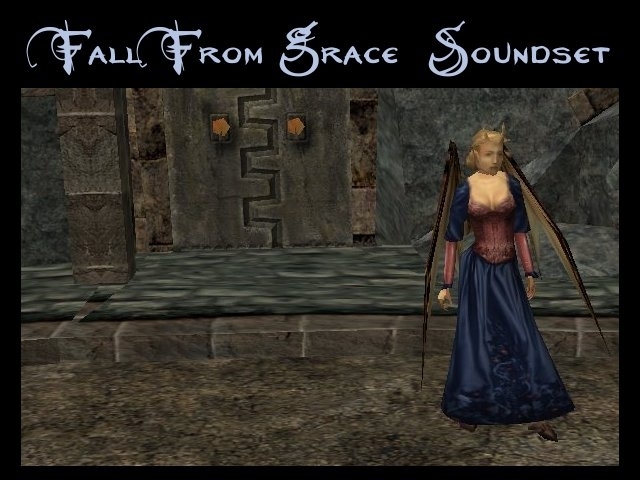 This is a soundset for female characters using the voice of Grace from "Planescape: Torment". As this is my favourite soundset from any game, I thought it might be a good idea to make it available for Neverwinter Nights characters. It would be suitable for a good or neutral character to whom faith is not unimportant, and who keeps a cool and reasoned head most of the time. The soundset has been tested in both games and shows up as "Harper Scout" in character creation. I have come across other Grace conversions, but I wasn't completely happy about using them, because they included PS:T specific references (e.g. "The brothel was a learning experience...") that wouldn't fit in with my NWN characters. This soundset is reasonably devoid of Sensate references, and as a result is quite versatile. There is a separate download for NWN1 and NWN2, because soundsets work slightly differently between the games. In NWN1 you need a custom talk table to make the soundset work for PCs (this way, it displays the character's utterances in text over the PC's head), but in NWN2 you don't (however, the soundset.2da for NWN2 is significantly expanded). So, if you want this soundset for NWN1, download GraceNWN1.7z - and, if you want it for NWN2, download GraceNWN2.7z. If you want it for both games, download both (it's just easier). Or, if you want it for both games and are on slow dialup, you can download GraceCombo.7z and convert the NWN1 version to usability NWN2 by following my instructions in a text file. The NWN1 version contains a small demo module, which is associated with the hakpak and the custom talk table. The demo module was made with toolset version HotU 1.69 Beta 2. The NWN2 version does not have a demo module, because I don't think it's really necessary (custom voicesets are much easier to add to NWN2). PLEASE NOTE: I'm putting this up in 7Z only, but you don't need 7Zip to decrypt 7Z files. WinRAR opens them as well, and most people who download things from the Vault will have WinRAR. If anyone who doesn't have WinRAR desperately wants a plain ZIP version, just ask. But, honestly, for the sake of a small download for WinRAR, you'll save yourself a lot of time later being able to download better compressed files in RAR and 7Z format.